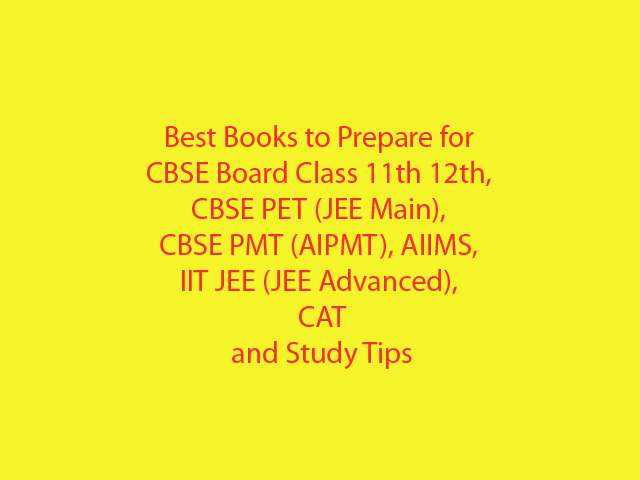 These books are more than sufficient for Entrance exams mentioned below. Reasoning is a mixture of english and maths. DI comes a lot in CAT. Read limited number of books thoroughly and understand it and revise it while studying new topics. I have tried to give as less books as possible (but it cannot get less than this). You can skip the optional books as books before them are sufficient. Only refer to optional books if you have time. Read Books in order. Basic textbook and guide are must to read. Try finishing one chapter in one subject, solve its objectives from Objective MCQ book (for PET and PMT). Then move to another chapter in another subject. Keep revising previous chapters while reading new chapters (will save lot of time on re-understanding them). Do not do more than 2 chapters at once and that 2 chapters should be from different subjects. Rotation of subject will keep you more interested. Work according to plan, managing time, working efficiently, saving time and using saved time for studying (other wise what is the point of saving time). Avoid distractions. It is not necessary to meet every friend regularly, better have few quality friends. The TV serials stories are never going to end so do not waste time there. Try to keep away from time consuming things like 15 day marriages. If becoming a cricketer is your goal stop preparing for competitive exams. Do not waste time, as you will not get it back and feel that you needed more time during the exam. Playing does not fails anyone, but if you keep playing and watching entertainment all day you will not study enough and you will fail. Avoid negative friends and people completely, they are poison for your life and mind. Concentrate, focus and keep studying. Control your mind and avoid distractions. Sleep for 7-8 hours daily with half hour sleep in day (when you are completely tired and sleepy) if possible. Sleep early at night (11 pm) and get up early in morning (6-7 am), which will keep you more healthy, energetic and active during the day. Do yoga, exercise and meditation in this order every morning to keep mind and body healthy. Give first priority to health, you can do nothing without it, and nothing gained matters for sick person. Keep extra time for unforeseen obstacles and circumstances. Play and have entertainment in controlled amount every day to keep mind healthy. You cannot increase the time in a day, you can only increase your speed and efficiency and save time from useless things. Read with interest, try to understand maximum, try to solve problems in fastest way. To solve faster you will need to understand concepts better and that is what is required. Avoid mugging anything, try to understand it, why it happens, how it affects other things, find relations within topics. Read basic first than advanced topics. If after seeing a question you are clear about its solution, leave it and move to tougher problem, as there are lots of questions and limited time, do not waste it on solving very easy and similar questions. Read in silent environment to focus mind. While reading focus on completing and understanding the topic, focus on it. Study topic wise not hours wise. Instead of reading 10 hours every day, have flexible schedule. Like try to finish a chapter in maths in 3 days. Try to read and understand faster. For this you will need to take interest in topic. You read very slow and do not understand anything when you are bored. It is better to read for 1 hour at triple speed than read slowly for 2 hours, which leaves you one extra hour to play and you still get one more hour worth study done. To remember what you have read and understood it is very important to revise. Thinking about the topics you have read in free time and trying to apply them in questions is best way to remember the subject matter. Yes, quality of English is best in “The Hindu”, but I always found it uninteresting compared to TOI, that is why I suggest reading literature too. Since interesting things are remembered more easily. In any case reading “The Hindu” is highly beneficial for CAT preparation.